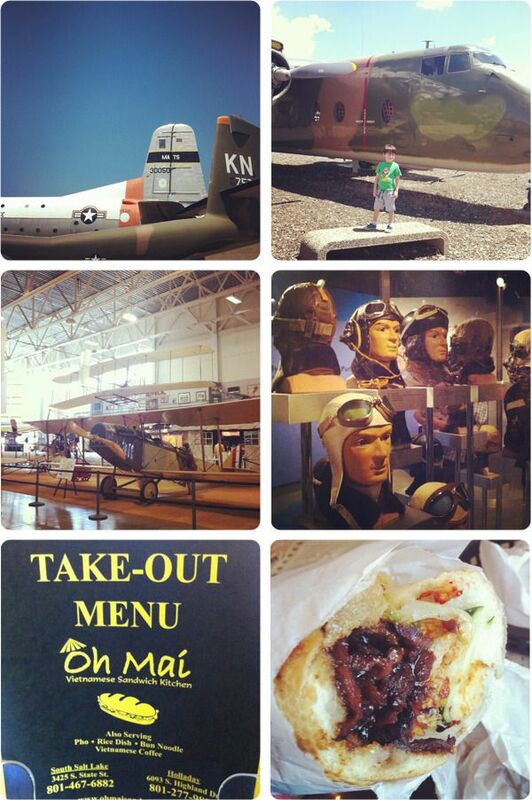 On Saturday we took the kids to the Hill Air Force Base Aerospace Museum. My dad is retired Air Force and I have fond memories of going to air museums and air shows on base when I was a kid. I knew that E would love looking at the airplanes. E went nuts for the planes. The museum has about fifteen planes / helicopters parked outside but it also has two big hangers with more planes and displays inside. I especially liked the display of WWII pilot helmets. It was interesting and a fun sort of creepy with all the disembodied mannequin heads. There's a gift shop but not a snack bar. However, there are several tables outside so you can bring your own lunch and have a picnic underneath the wings of one of the planes. If you're planning on visiting, I would keep the weather in mind. It was HOT on Saturday and while it wasn't so bad when we were outside with the breeze, the hangers were pretty stuffy. It must be difficult/costly to fully air condition such large spaces and by the time we were finished looking at everything we were all pretty sweaty. The museum is in Roy, so it's a little over an hour's drive from our house. On the way up we stopped for lunch at a new-to-us restaurant, Oh Mai. They serve bánh mì and other Vietnamese-style sandwiches. It was really good! N and I got a few different types of sandwiches and shared them. They even have a Korean-style rib sandwich with kimchi on it. Yum!